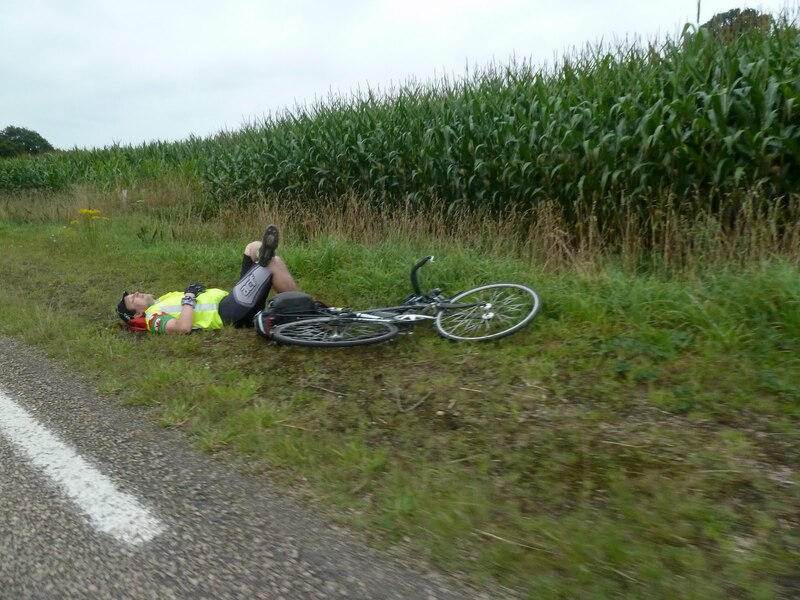 Sur les guidons dits « 3 positions ou course » les prolongateurs avec repose avant-bras sont autorisés à condition qu’ils ne dépassent pas la ligne passant par les points les plus en avant des poignées de frein. On handlebars known as "3 positions or race" extensions with forearm support are allowed provided that they do not exceed the line passing through the most forward points of the brake handles. In any case, doesn't look likely I'll be able to get my bullhorns past the bike inspection which is a bit boring. Two or tree wheeled bikes only. Those folk in Quattrovelos are going to need special dispensation. So it's the same rules as in Olympic triathlons. Nothing longer forward than front of brakes. These will be legal, just like the good old spinaci. I've seen (on PBP videos) Spinacis in use, masquerading as bar bag supports. That was a major reason I didn't enter a 4th PBP (they brought in the handlebars restrictions after my 3rd, 1991) and by then I was using 'bullhorns' (not a word I like) as I have done ever since. But it looks like bullhorns may only be a problem from now (depending on how you read the restriction). I think "3 positions or race" must mean road drop bars*, so it's not saying much at all about any other types of bars. I would like to see some clarification on flat bars with bar ends as I intend to use a touring bike with such a configuration. As I understand the french rule they are only talking about "guidons de course", which are drop bars in anglo-saxon. I would have thought that bullhorns should be ok, your hands are next to the brake levers. I don't know what the rules are on flat bars with horns but the situation is not as extreme as tri bars; perhaps they couldn't complain about stubby extensions that don't come any further forward than the handles of the brake levers. Indeed, that has already been discussed at the relevant level. The intent of the number of wheels limit is to prevent rollerbladers and suchlike from participating. Same for the 'chain drive' requirement after Alpo on the Kickbike at PBP03. Fit handlebars with long ramps to push those brake levers further out and you won't have to trim the aerobars. Our Chairman, Chris Crossland, is travelling to Paris this weekend for the annual "presentation" from ACP. It may be worth asking him to see if he can get clarification on any points that concern members. It's probably best to email him at chair@audax.uk with any specific questions to ask. Especially as there are also a few informal sessions with ACP representatives around that meeting. That depends. If it's a rolleblader with a good technique, usually someone with a marathon speedskating background, then it's not such an issue. If it's someone with an ice-hockey style background, that's a completely different problem. That bit about "must not be pointed forward" is completely absent from the cited French spec. Seems like the translator added it gratuitously. Chum of mine had no problems with bullhorns in 2007 or 2011. His brake levers point backwards, though. Prior to the 1995 PBP we (on behalf of AUK) sent ACP a sheet with several sketches of possible handlebar configurations, for their comment. Included were bullhorns, straight bars with extensions at the ends or inboard, short and long tri-bars, butterfly bars, I think there were 8 sketches in total. They returned the sheet with all the sketches crossed out except the standard road drops. That was then of course, things have obviously moved on since. It was probably one of those situations where it would have been better not to ask the question. I rode flat bars with bar ends (not extensions, per se) in 2015 and Eduard (bike check) raised his eyebrows and nodded it through. If he had said "non" then I would've removed them there and then and probably refitted them up the course somewhere, as they barely showed forward of the bar, being mid-mounted. There was a mountain bike tandem that I drafted for a while, and they also had bar ends ISTR. It was probably one of those situations where it would have been better not to ask the question. I rode my mountain bike with multi-position bars in 2003, the bike checker called for an adjudication on seeing them and the adjudicator just waved them through. Each time I've ridden PBP I've seen a few people riding flat bars (with or without bar ends) and I can't imagine that they would suddenly be banned this time. It's just tri-bars they don't like, however in trying to provide a quasi-legal definition of a tri-bar other configurations get included. Fortunately the officials take a very French attitude to regulations and ignore them.